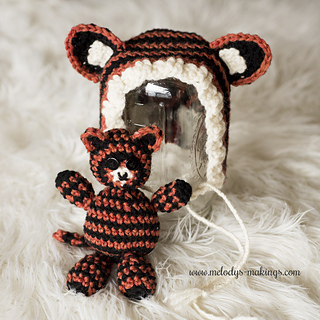 The Tiger Bonnet and Stuffie set crochet pattern is one of those that just makes you go “Awwww!” It”s perfect for any baby or toddler and not only gives them an adorable hat to wear, but a super squishy stuffed animal friend to love on as well. This is a beginner-intermediate level design. 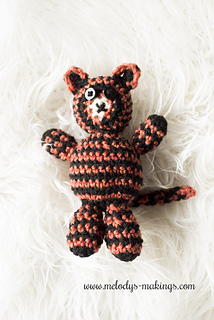 This pattern calls for worsted (4) weight yarn and size 5.5mm (I/9) crochet hook. I am always available to answer any questions you might have. You can contact me at melody@melodys-makings.com. 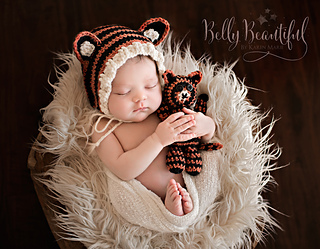 Thank you to Belly Beautiful Portraits for the gorgeous photo of the crochet version in action. 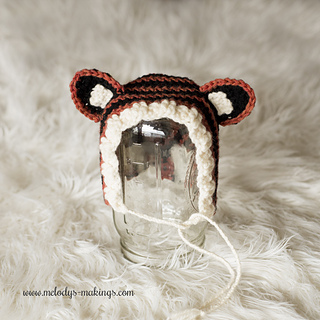 If you are unhappy with the finished item made from one of my patterns, I will happily refund your money. Before refund, I will ask you to provide me with two photos. One photo of your finished project made from the pattern in question, and one photo of your gauge measurement on your finished project. Because matching gauge is such an integral part to creating a high quality finished piece, I confirm that you took the extra time to match your gauge before starting your project in order to process your refund.